Those that know me, know I have a huge passion for cars so being able to create an event which celebrates this passion at my own country house hotel was a dream come true. We welcomed over 200 guests to our ‘Celebration of Speed’ event, showcasing a range of prestigious cars, serving our unique afternoon tea and serenading them with the Swing Kings, all followed by a Q&A with our guest speaker, Paddy Lowe. 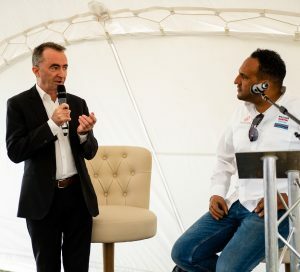 It was a pleasure for me to invite Paddy Lowe to the event, with his wealth of F1 experience and fantastic F1 stories he was the ideal guest for the event. To match the brilliance of Paddy, we were also lucky enough to have two classic F1 cars from Williams Martini Racing. 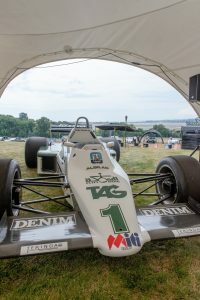 The FW08C was the first F1 car to be driven by Ayrton Senna, who tested at Donnington Park in 1983. Senna completed 40 laps and setting a faster lap time the Keke Rosberg and Jacques Laffite that season’s race drivers. The second car to arrive at the manor was the fascinating FW36, this was the first Williams car to use a Mercedes engine. 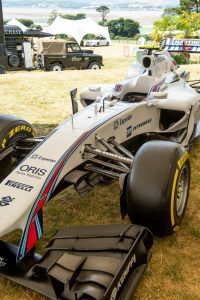 Created following the 2014 engine regulation change, it was the first turbo-powered car Williams had had since 1987. This improvement to the car had clear results, with 9 podium finishes and a 1-2 qualification for the Austrian Gran Prix. Alongside the fabulous F1 cars we invited our local partners to showcase the very best of the extensive ranges. We had Porsche, Ferrari, Maserati, Jaguar, Land Rover, BMW and Mini, all kindly sponsored for the day’s event by Helston Garage from their respective local dealerships. Helston Garage remained on hand for the duration of the event to help guide guests through the cars and their capabilities. I can’t wait to start planning next year’s event, the team and I have some great ideas on how to make the experience evening more exceptional. I look forward to welcoming you back in July 2019, to keep up to date with all the events at Lympstone Manor see the events page.